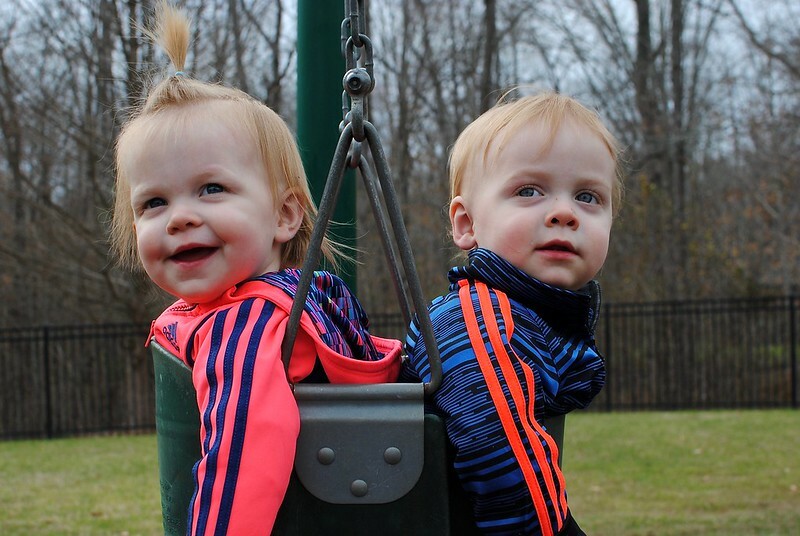 My children are now one and a half years old. By the time I post this, they’ll actually be closer to two than they are to one, which seems crazy to me, but the facts check out. Time is indeed passing. Since I last updated here, they’ve had so many milestones. Some were not so fun: first (among many) sick visits to the pediatrician, first surgeries (ear tubes for both). 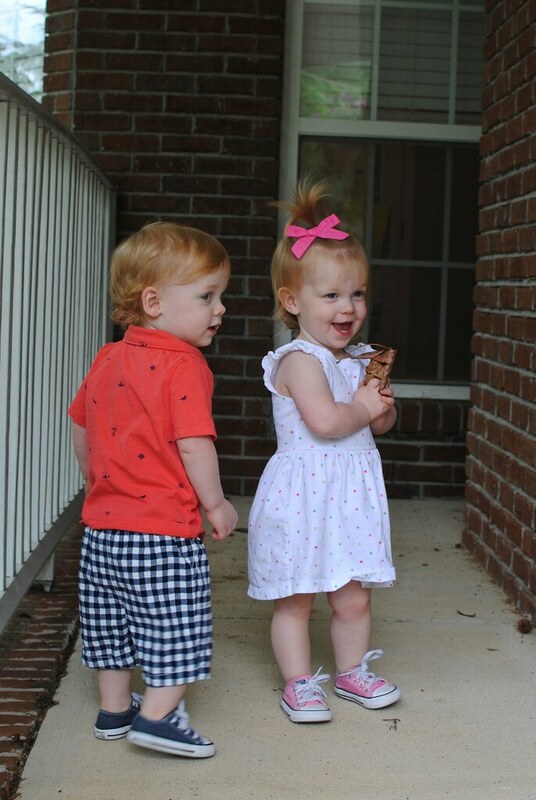 But then we got to enjoy things like their first Easter egg hunt, first artwork brought home from “school,” first time in a swimming pool, first time walking through the parking lot holding hands instead of being carried, and of course first words! Neither baby is talking much yet, but now that they’ve got their ear tubes and can actually hear (after months of constant infections and fluid in their ears), we’re not worried. They’ve made a lot of progress since getting their ears clear. 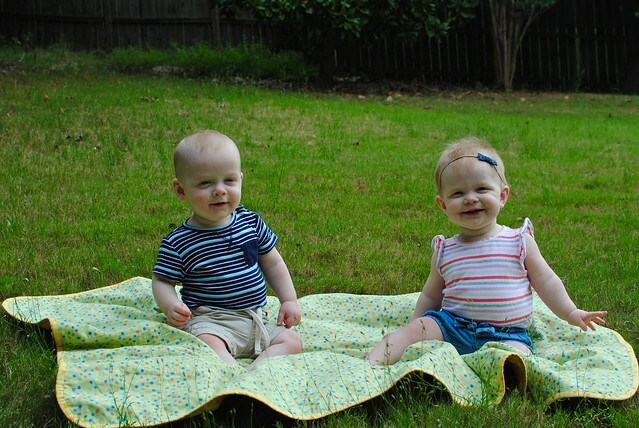 They are fun and funny and love to imitate each other and make each other laugh. They run to hug each other at the end of the day whenever one of them has been home sick from school. If one of them is crying, the other one will offer a binkie, stuffed animal, or book to ease the pain. The other day, E was crying about something in the tub, and L just reached over to her and started gently touching her face, pointing out her nose, eyes, ears, and so on — this is one thing I often do to distract them from fussing (“Where’s your nose? Where’s your belly button?”). Let me tell you, when L started doing it for E, it was the sweetest thing in the world. Can consistently say dada, mama, ba(ll), hi, hello (when pretending to be on the phone), bye-bye, da (what’s that? ), and something that sounds like shoes. Occasionally she will also say do(g) and something that is either milk or mine. Can sign more and all done. Loves to eat cheese, yogurt, and veggie burgers. Will finally wear a bow in her hair all day, unless she sees it in the mirror (for example, while riding in the car), in which case she will promptly remove it to play with. Is obsessed with shoes and is super excited whenever she gets new ones. 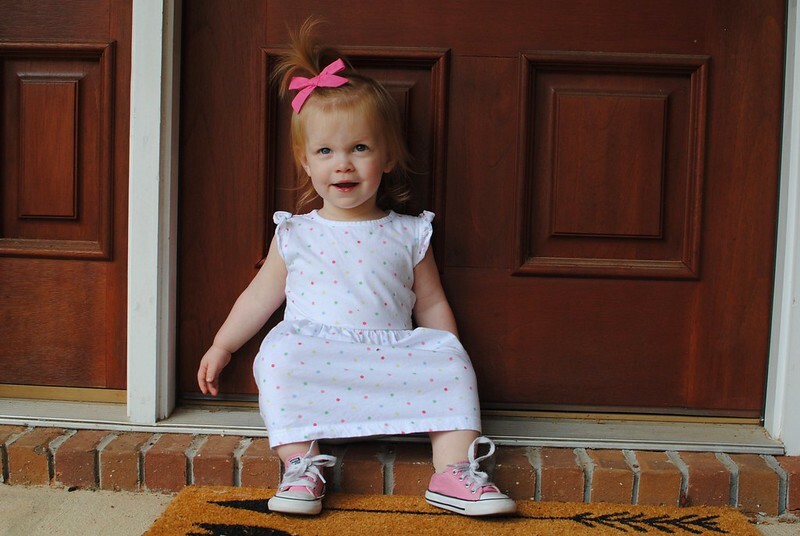 She carried her pink Chucks around lovingly all day the first day she saw them. 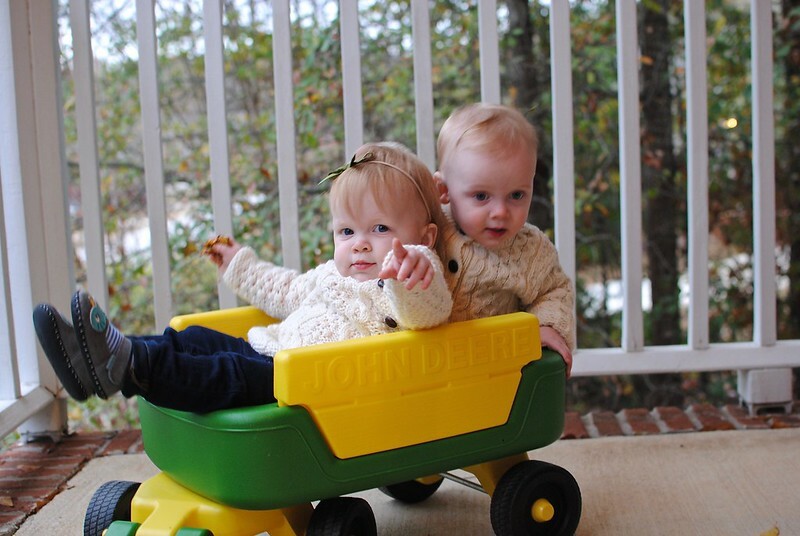 She even gave them rides on the toy tractor. Can say hi, bye, da (what’s that), woof (when asked what a dog says or when seeing a picture of any animal) and will babble all the livelong day in sounds that really sound like words, but aren’t any words I know. Can feed himself with a spoon and loves to dip his food in any kind of dip or sauce. Loves all fruit, cheese, bagels, yogurt, and avocado. Has 10 teeth all the way in and two new ones just surfaced. Loves his stuffed snow leopard, Leonard, and likes to carry him around and give him hugs. 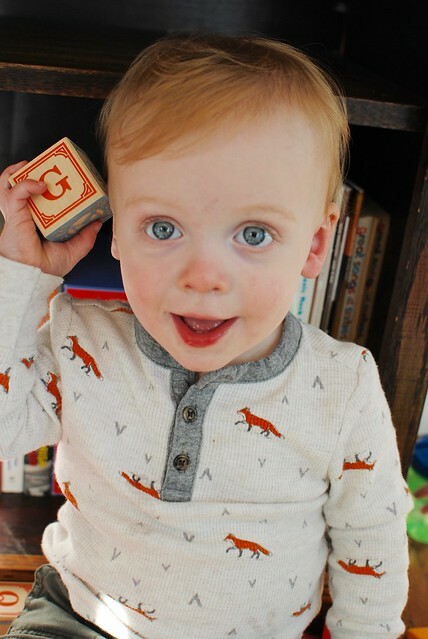 Loves books and will happily flip through, studying the pictures, endlessly. They are exhaustingly wonderful and I am often in grateful disbelief that I get to be their mom. One year old. I can barely believe my babies are ONE YEAR OLD, but the calendar does not lie. 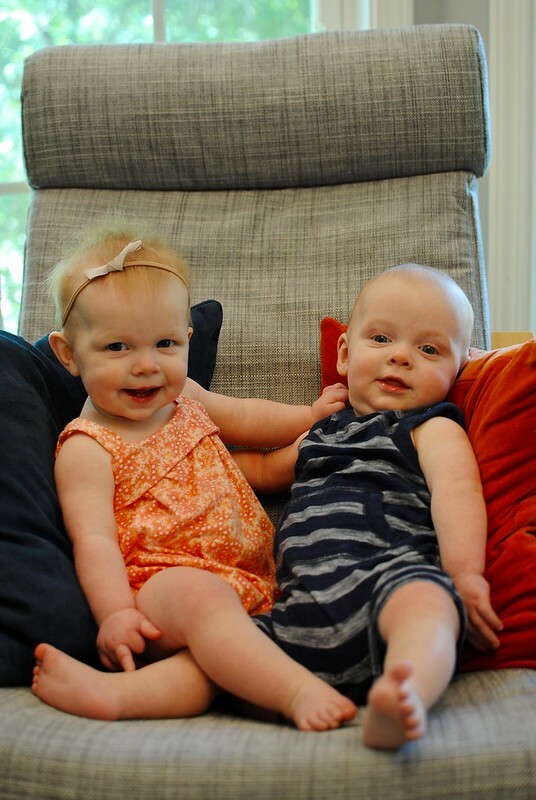 This time last year, they were squishy, tiny, wrinkly little babies who weighed a total of almost-twelve pounds at birth (and less than that when they came home from the hospital). In the past month, they’ve had their first Thanksgiving, which was great fun. 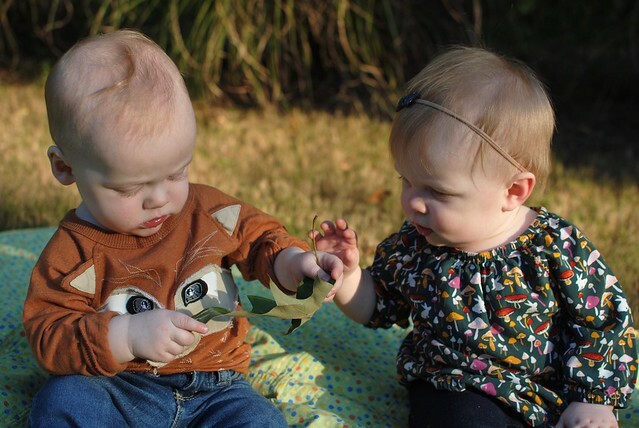 Last Thanksgiving, we were just not sure how soon the babies were going to come, so we held off on making any plans because we thought we might wind up in the hospital. It turned into a quiet day at home (my husband cooked) and the babies waited another week or so to make their arrival. This year, we had two new little faces at our table! We let them try all the foods we were having: roast chicken, mashed potatoes, roasted root vegetables, green bean casserole, cranberry sauce, and pumpkin pie with whipped cream. They loved everything except the moment when CW sprayed a tiny, tiny blob of whipped cream into their mouths directly from the can (they were not into that at all, whoops! ), but then they wound up enjoying dessert when we put a little bit onto their trays for them to pick up themselves. Saturday, we had their birthday party, which turned out to be really fun. My BFF Claire a and her son visited for the weekend, plus we had our local friends over, many of whom also have little ones. There were a few kids around from age 5 months to 9 years, and they had fun running around and playing with some of the twins’ toys. We had brunch food and mimosas and cupcakes, and of course tiny smash cakes for the babies to try. Y’all. The cake. It was amazing. E enjoyed her cake, which she dug into with one hand and ate fairly neatly. L, on the other hand, quickly realized that cake is delicious and that eating with one hand is not nearly effective enough. Perhaps he realized that this was a limited-time situation and that the cake would be taken away at some point, so he decided to dig in with both hands — and then quickly moved on to diving face first into the cake. We were DYING laughing. I will never forget it. Dude just kept going and going, both hands sunk knuckle-deep into the sides of the cake, frosting all over his face, and eventually ate (“ate”?) a not insignificant portion of cake and frosting. I am so proud. Has four five teeth. Her top two were slowly, slowly coming in over the past few weeks and they finally broke through. In the time it’s taken me to get photographs ready for this post, her fifth tooth (bottom left) came in! Has taken 10-12 independent steps at a time on several occasions, but still doesn’t choose to walk very often. She prefers to walk while holding one of our hands or to crawl. I’m sure she’ll get to walking full time very soon, though. 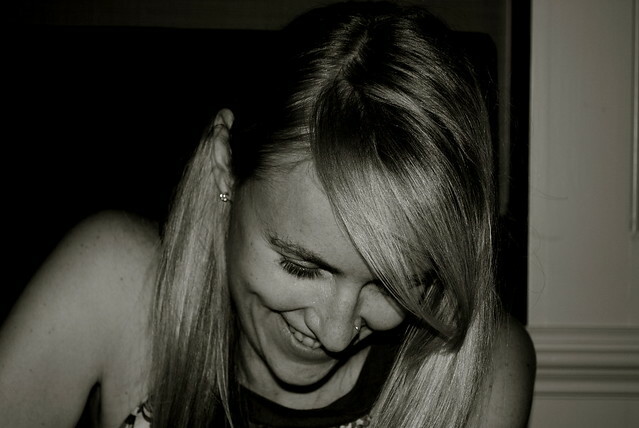 Still scrunches up her nose when smiling and generally smiles with her whole face. She has the best dimples. 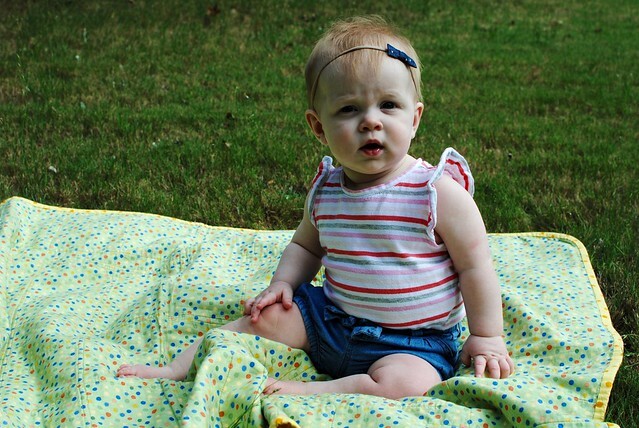 Has started refusing to wear her headband bows, to my great dismay. And so it begins: soon I’m sure I’ll have no influence at all over what she wears, so I’d better enjoy choosing her clothes while I can. “Talks” quite a bit, though not with (m)any real/intentional words, mostly just babbling. She’s said “mama” and “dada” a few times, and “da” (possibly directed at the dog?) but we’re not confident any of those counts as a purposeful first word yet. Points, claps, waves, and gives high fives — the lattermost she just learned this past weekend from her big buddy, Liam (my BFF’s son), age 9, who came to visit and is an excellent teacher. Can be both a little bit shy and extremely friendly in the same moment — she loves to smile and wave at new people, but often only wants to do so from the safety of her parents arms/laps. Loves to play with her Little People farm animals and put them into their places in the barn. Sometimes she also loves to stick the animals in my face until I let her put them in my mouth. Why, E, why? Has four teeth. The second top tooth came in shortly after I last posted about this, so they’re well established now and he’s been putting them to good use gnawing cantaloupe off the rind and digging into birthday cake. 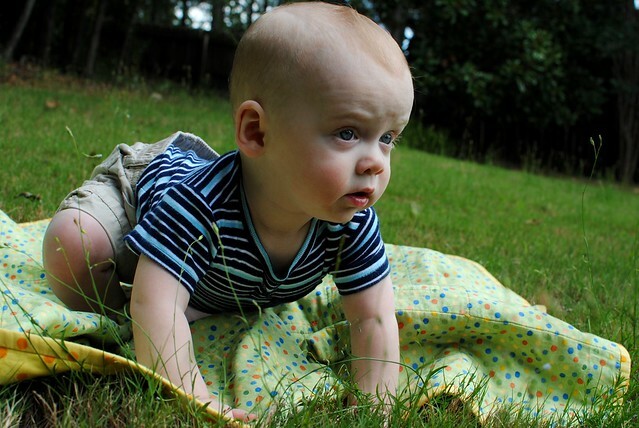 Has taken 1-2 independent steps at a time, but mostly has been working on his climbing skills. He’s able to get up onto the futon in the nursery and onto the ottoman in the playroom without assistance. Has the most delightful full-belly laugh. The other day, I started goofing around with him and something about the way I was shaking my head back and forth made him laugh, so of course I just kept doing it over and over until he was completely CRACKING UP and it was the absolute best. I love making this kid laugh. Loves to read stories. He will get his favorite books off the shelf and bring them to us to read. I love letting him cuddle up in my lap while we read — he usually holds my hand/wrist and just snuggles up so sweetly. His favorite books recently are Brown Bear, Brown Bear and The Very Hungry Caterpillar. Has just started “talking” a lot more. He’s always been a bit quieter than his sister, but lately he’s really got a lot more to say. He’s experimenting with new sounds. My favorite one is the “ga” sound he makes every morning when he sees the lit-up Christmas tree for the first time. He really likes it, I think. Points, claps, waves, and gives high fives. And loves to grab people’s glasses right off of their faces! I find it a lot easier to wear my contacts, quite honestly. He’s obsessed! Loves his stuffed animals, particularly an old monkey of mine that I handed down, and a new snow leopard his dad picked out for his birthday. He’s so sweet when he hugs them. I love watching them grow up so much. We’re so lucky and thankful to get to be their parents. E&L turned eleven months old on Friday. It’s so weird how time keeps passing and every month they’re another month older, isn’t it? Yeah. That. 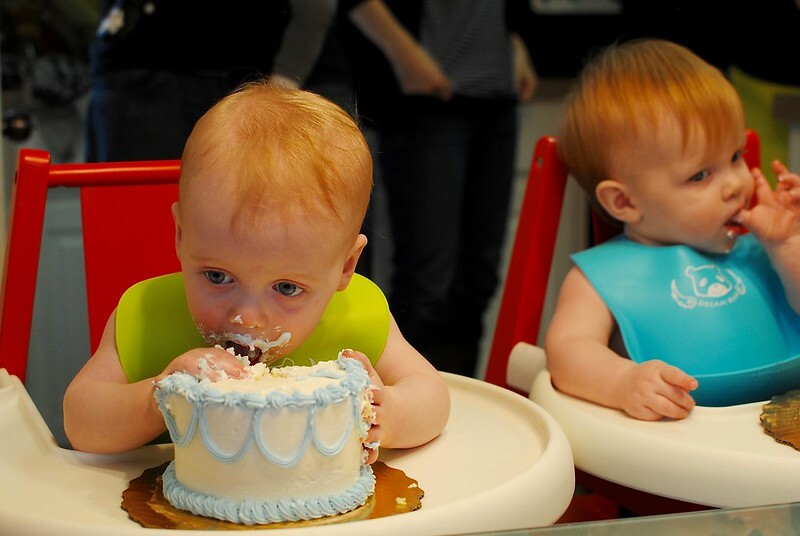 In less than a month, we’ll celebrate their first birthday. Somebody hold me! They’ve grown so much, I’m constantly amazed. Last week, I swear L’s feet grew so much overnight that his little sneakers no longer fit him. How does that happen?! This past month they celebrated their first Halloween, to everyone’s great delight. 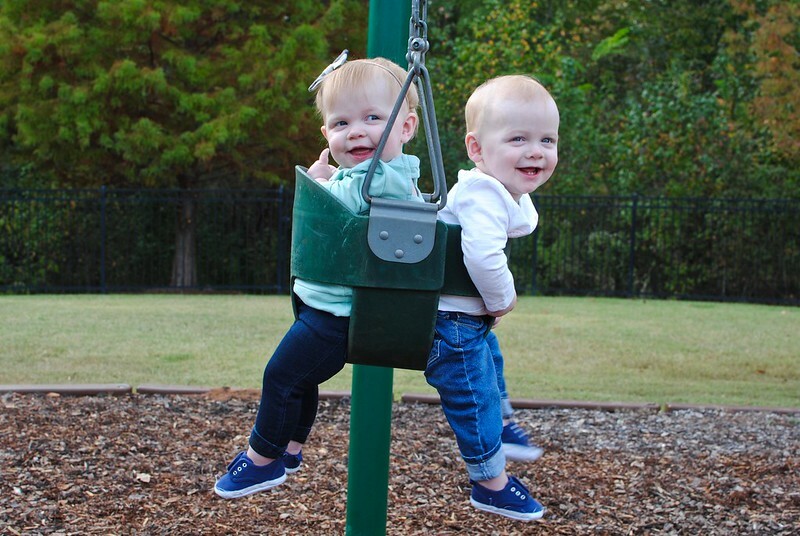 They also had their first trip to the neighborhood playground to play on the swings. 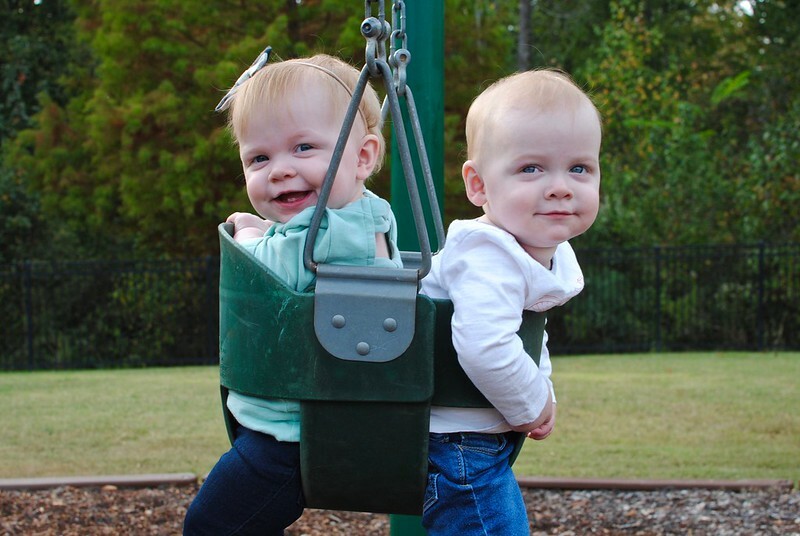 As you can see here, they are the perfect age/size to share a swing, and they had a blast. The loved going down the slides (in our laps), too. 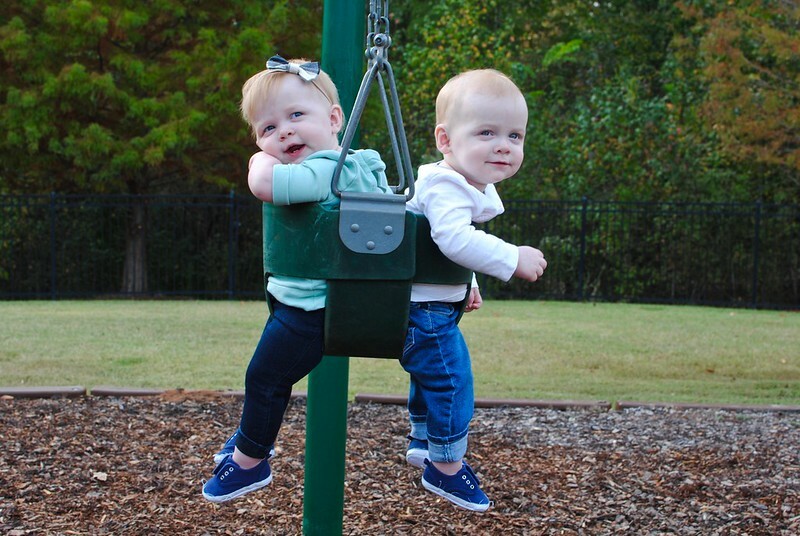 I’m so thankful for slightly cooler weather, which means we’ll probably be spending plenty of time down at the playground in the coming weeks. has learned to clap and will do it pretty consistently whenever we do, and often on her own. She claps during meals a lot, possibly because she’s excited about food. I think we might be related. stands up on her own whenever she wants, and can easily sit back down again without falling. She’s taken a step or two, but so far only when one of us is holding her hand. “talks” (babbles) all the time. She has said “mama” and “dada” to/about us a couple of times, but I’m not sure if it was intentional or not. She’s getting close, though, I think. The best part is that she’s just always got stuff to say, so I hear her little voice all day long. It’s adorable. is holding steady with just her two bottom teeth for now. finally got that new top tooth he’d been working on for what felt like months. It popped through a week or two ago. The drool is still coming, though, so either he’s just a drooly baby or the other top tooth is on its way (I can’t tell). 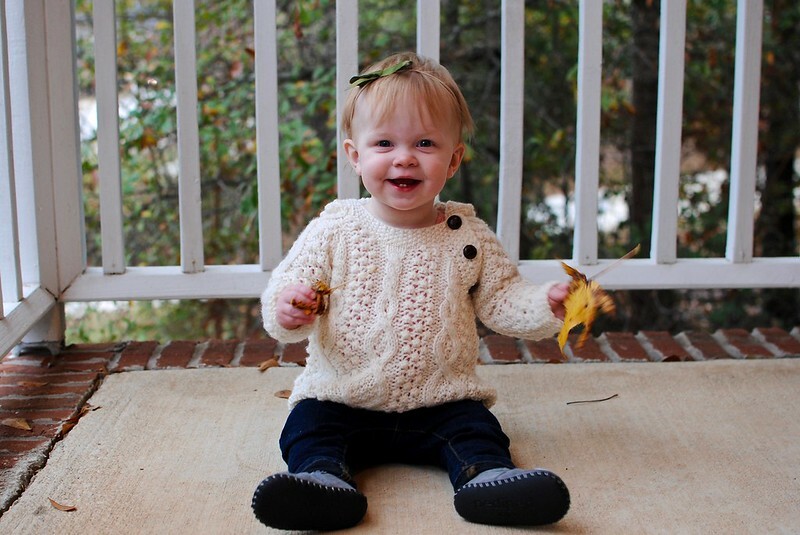 just learned to clap for the first time yesterday (so, technically after turning 11 months, but whatever). He was SO pleased with himself and wanted to clap along with the rest of us all night. Just darling. has figured out how to climb up onto the futon in the nursery if he has something to boost up one leg with — such as a toy or his sister’s back. Danger Baby! 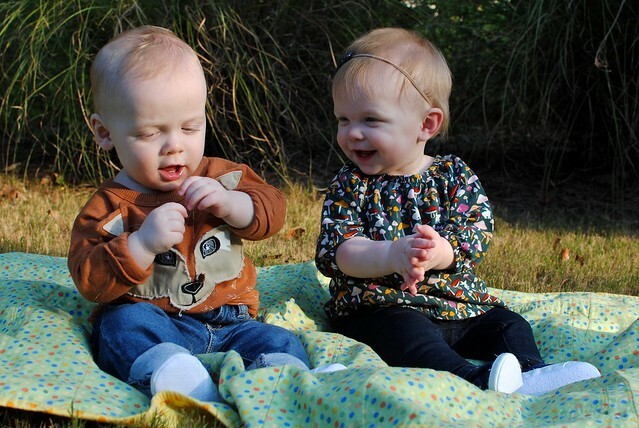 loves to laugh at his sister and imitate her. She was spitting her food out and blowing raspberries at dinner the other day and he was DYING laughing. Just cracking up. Then he started doing it, too, in between laughs. He just loves her. We have so much fun with these two. It’s even better than I imagined, you know? 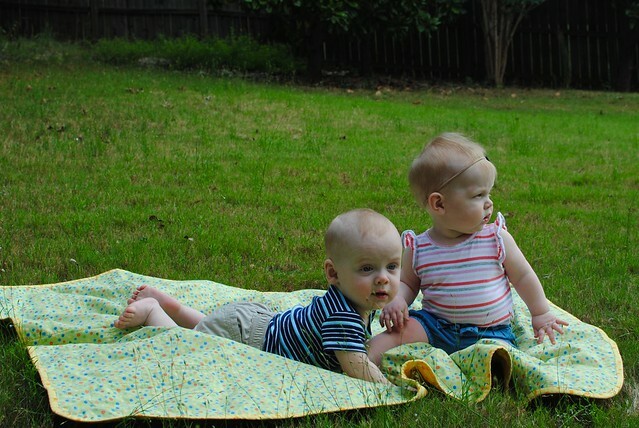 E and L are now well over ten months old (I’m a little behind in my updates). 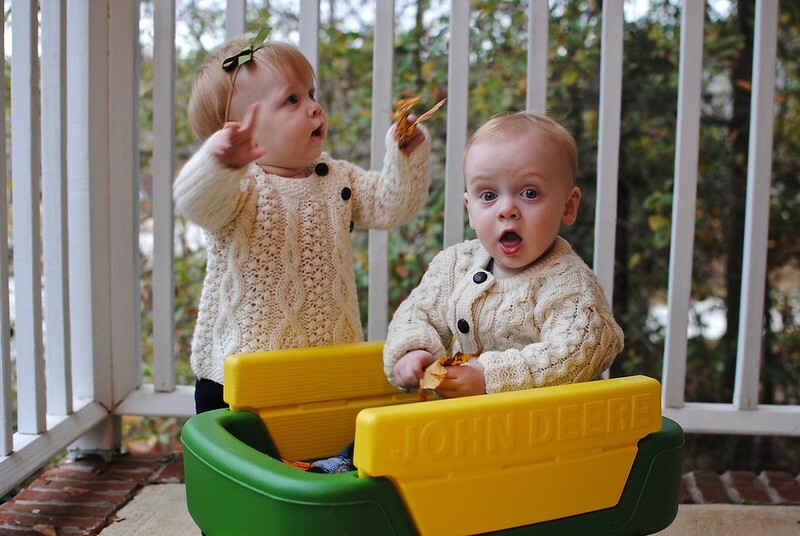 I can’t believe how soon they’ll be celebrating their first birthday — yikes! They occasionally seem to have grown overnight, and they’re now wearing the 12-18-month clothing I bought them for this fall and winter. Some of it’s a little big, still, but it basically fits. I can’t believe how big they are! They had a less fun milestone recently: their first cold. It hit E a lot harder than L, and we were constantly having to help clear her nose with the Nosefrida (recommended!) so she could breathe while drinking her bottles. Poor Booboo. It’s cleared up well by now, but it was pretty gross at the time. Their cold had the bad luck of striking while I was out of town for the weekend — my first ever trip away from the babies! That was its own kind of milestone, I suppose. It was odd to be away from them and I missed their baby snuggles, but it was a good thing for me to get time to go somewhere for myself — and of course CW handled everything just fine in my absence (although I wish he hadn’t had to deal with sick babies on top of it all). Can stand up and sit back down without support and practices this skill over and over again. Still has only two teeth with no signs of any new ones coming. So. Should I order some baby dentures, or what? Heh. Loves to give hugs and, when we’re burping her after a bottle, pats us on the back to help us burp, too. Thanks, Jellybean! Cruises around on all the furniture and will walk around the room while pushing his activity table (as if it were a push toy, which it’s not designed to be, but Blueberry DNGAF). Still has only two teeth and still drools all the livelong day, convincing me he’s about to cut some new ones, but has been doing this for over a month with no changes. Is an extremely fast crawler and LOVES to play chase and hide. Makes a whirring, trilling noise whenever he gets excited, especially when we come into the room first thing in the morning. They honestly just continue to be such delightful babies. They sleep at night (mostly) and nap well (mostly); they love to eat; they play together all day and love to be with us; they charm old ladies at the store and love their babysitter. We just adore them. 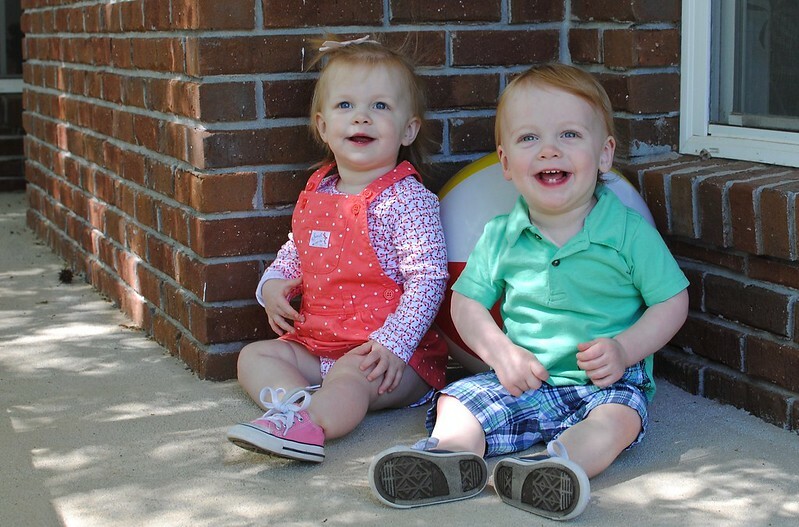 My little Jellybean and Blueberry are nine months old as of Sunday. Nine months feels like an awful lot of time. 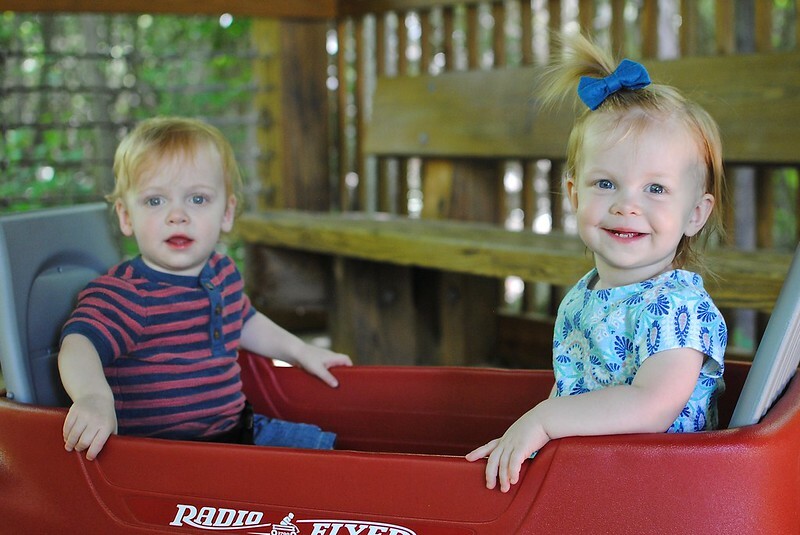 They were only on the inside for eight months, after all, and that felt like forever. They’re growing and changing and learning so much every day now — it seems like they’re different people every time I look around. Wasn’t I just carefully hovering around them as they tried to balance while sitting, for example? Now they’re standing up, so I’d better get to hovering in a slightly more elevated position. Things are exciting. They’re going everywhere and getting into everything — with a distinct preference for things they shouldn’t be getting into. Cords and wires, tiny objects, and breakable things all seem to have some powerful magnetic force drawing the babies into their sphere. No, that phone charger is not a toy, young lady! They’re eating all sorts of new foods, finger foods especially. The recent hits have been Cheerios and pineapples. They also seem to like plain tofu, sweet potatoes, applesauce, and bananas. We also now have a part-time babysitter (two mornings per week, so far), which is kind of a huge milestone in that they’re being cared for by someone other than family for the first time. She’s great, by the way, and the babies love her, so we’re very happy to have her around. They’re relating to each other more and more, and often spend their mornings and their post-nap times sitting together where their two cribs meet, chattering to each other and passing their binkies back and forth in their own little game. 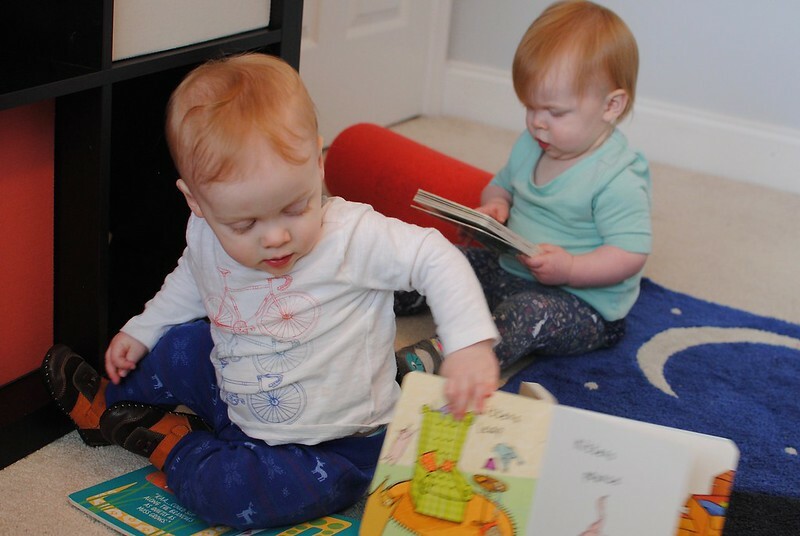 When they’re playing in their room, they’ll often follow each other around to see what the other one is doing, and, if it’s an exciting and/or destructive activity, they’re very quick to help each other out. Other times, they simply knock each other down, use each other to pull up to standing, crawl over each other, or grab each other’s faces. (Hashtag twinproblems.) They’re fantastic, truly. Weighs 18lb 5oz (52%), is 28.5in tall (81%), and has a head circumference of 18in (92%). 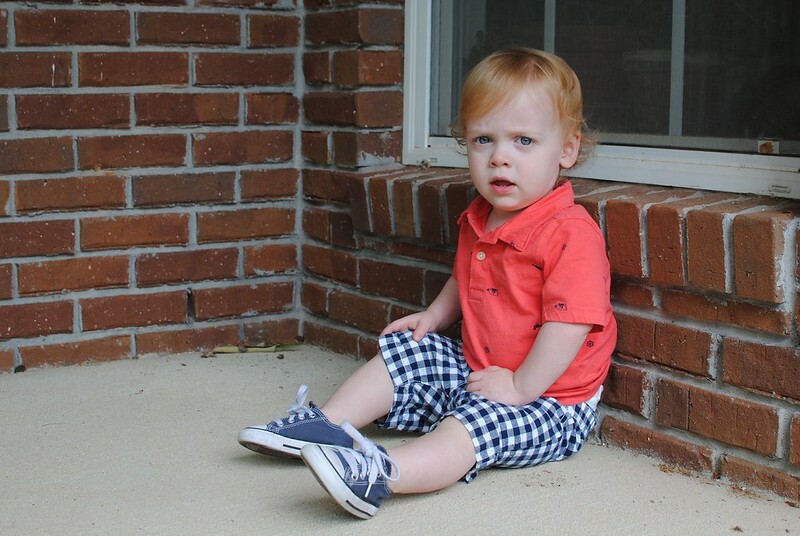 Can sit, crawl on all fours (no more inch worming), and easily pulls up to standing and sits back down. Has more and more fabulous hair with volume for days. It’s strawberry blonde. Her little duckfeathers have come so far! Still has blue eyes, in a deep, denim shade. They’re so beautiful. Has two bottom teeth with no immediate signs of any new ones appearing yet. 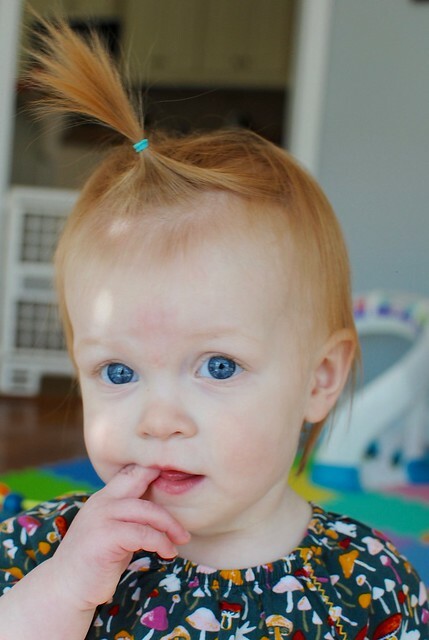 Loves to talk and chat in her sweet little birdie voice and then suddenly blow spitty raspberries right in your face. Hugs and kisses (or maybe just bites our faces?) and has tried to clap her hands a few times so far, but not reliably yet. Weighs 17lb 11oz (16%), is 28.25in tall (44%), and has a head circumference of 18in (70%). These are L’s best numbers yet! 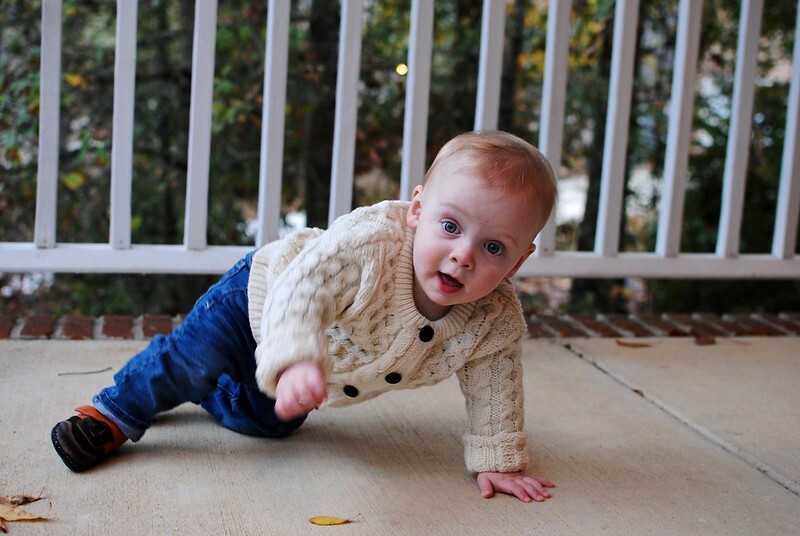 Can sit, crawl on all fours (no more army crawling), and easily pulls up to standing and sits back down. We’ve also seen him “cruise” from one piece of furniture to another a couple of times, but not reliably yet. Still can’t compete with his sister for hair, but his wispy red strands are getting a bit longer and thicker on top. Still has blue eyes, but they’re a light, bright, gray-blue with dark rings around the outside of the iris. Amazing. Has two bottom teeth and has been drooling like crazy for the past week or so. I can’t see any new teeth starting to come in yet, but they must surely be about to. 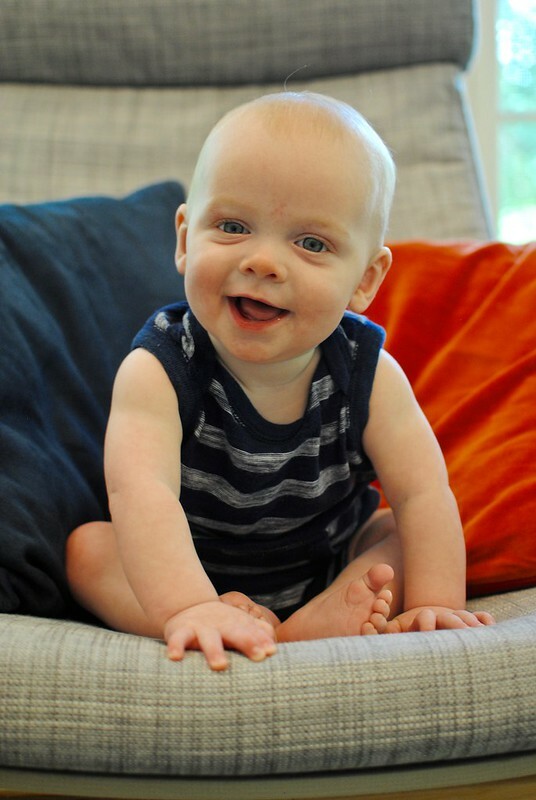 Loves to smile and laugh and giggle and thinks his parents and his sister are pretty hilarious. Recently learned to splash water from the tub outward and thinks it is the MOST FUN EVER to get the person bathing him completely soaked. Buddy. 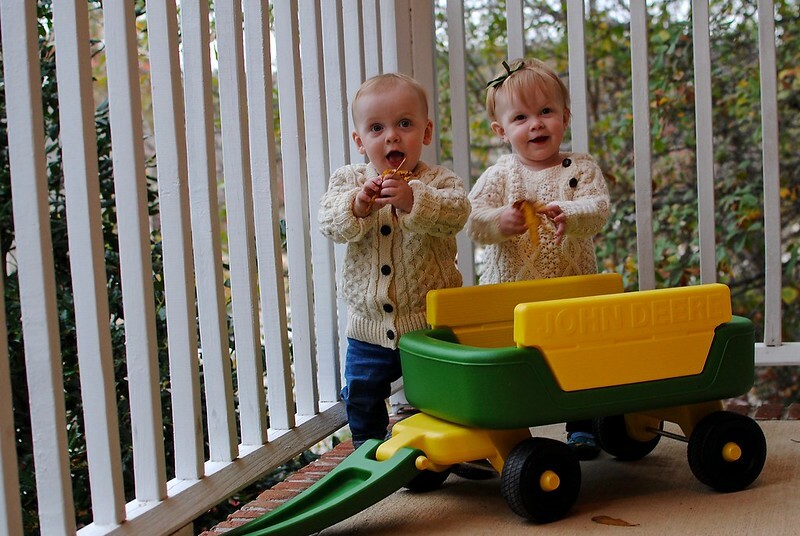 Needless to say, I think they are the best babies ever. When I think of all the things that had to come together for these two specific babies to exist in the world, I’m just astounded. And thankful. 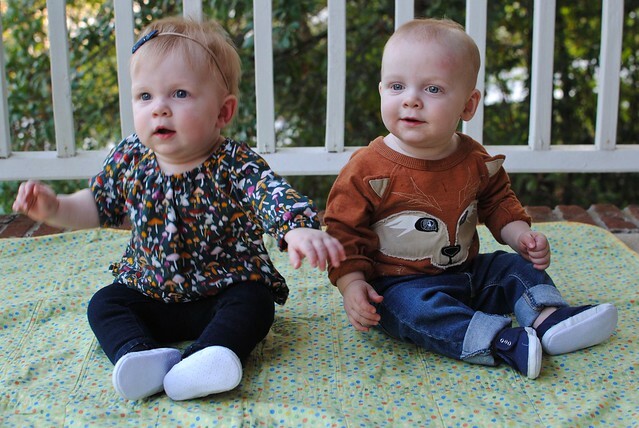 E&L are eight months old! That seems so old! I can’t believe it. Two-thirds of a year. They’re so, so fun right now. They’re learning so much, crawling, sitting, eating solid foods, and so on. They’re generally happy, interactive, and loving. Just a joy to be around. We went ahead and bought two new convertible car seats for them, even though they still currently fit in their bucket seats — we wanted to have car seats in each of our two vehicles, so we’ll have the new seats in one car and the old ones in the other car (until they grow out of them, when we’ll have to buy two more convertibles). We’re getting ready to have to lower their crib mattresses in preparation for them being able to pull up to standing, which E has recently started to try to do. So many changes are happening right now! The babies are adjusting with aplomb, but it all feels like quite a whirlwind to me, not least because I’ll soon be back at work full time. At eight months, both babies consistently sleep through the night (from about 7:15 – 6:00 or 6:30). Often, they will wake up at 6 in the morning and then hang out in their cribs, head to head, talking and cooing at each other for a good half hour before starting to complain. They nap twice a day for a total of about 3-3.5 hours. We’re so grateful for their improved sleep and napping habits! They take 6-oz bottles 5x per day, plus a mini-bottle right before bed. They’re eating solid food at dinner time, including purees, cereal, yogurt melts, and some fresh fruit/vegetables from their mesh feeder thingies. They’re getting better and better at grasping the small, bite-sized bits, so we’ll probably be expanding their repertoire soon. Has two teeth, and seems utterly unfazed by them. 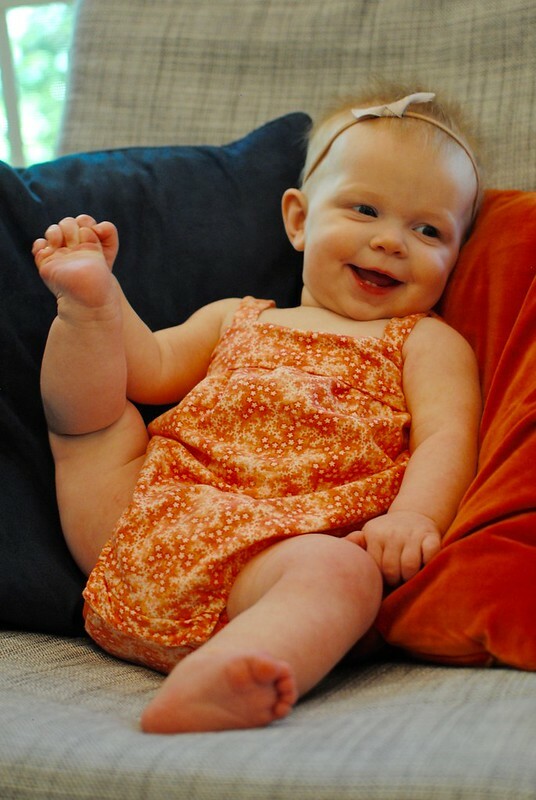 Can sit unassisted for long periods of time and can get up into a sitting position by herself. Tips over and bonks her head/face when she’s sitting, but is starting to do this less and less as she perfects the ability to brace herself with her hands. Crawls by inchworming her way forward, and is getting better and better at it. Continues to be a ready smiler and laugher and a happily independent player. Loves to practice making new sounds, cooing, babbling, and trilling. Has one tooth in and another (slowly) on its way. He seems more affected by teething in that he drools a lot more and seems fussier, poor guy. Can sit unassisted for brief periods, as long as there is something interesting him. Otherwise, he still prefers to straighten his hips and shoot up to a standing position (with help, of course). Crawls army style and is getting very fast at it! He’s so pleased with himself every time he crawls off into an unauthorized area — when we call out to him, he looks back grinning and laughing before proceeding forward anyway. Is starting to make more sounds and babble to himself more, especially when he wakes up in the morning. Spent 20 minutes laughing at me yesterday as I made funny faces and noises at him. Once he gets going, he’s unstoppable. 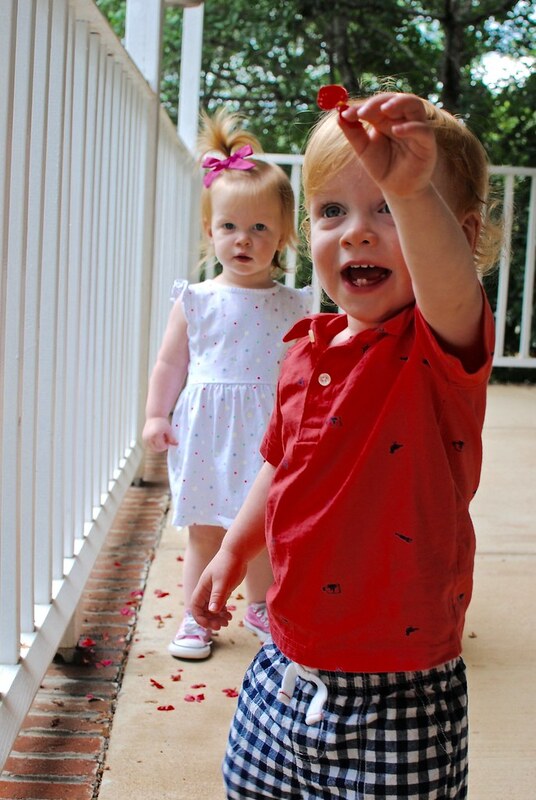 We have the best babies.